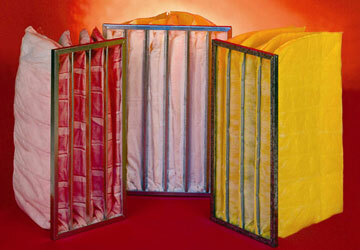 EMCEL Disposable Pocket Bag Filters are widely used for the removal of airborne particle contaminants where high dust loading capabilities are required in HVAC Systems. The multi-pocket design uses synthetic media to give maximum efficiency with minimal resistance. A rigid Header Frame ensures a precision fit and can be supplied with edge seals if required. Many sizes / efficiencies are available, please contact EMCEL for full details.